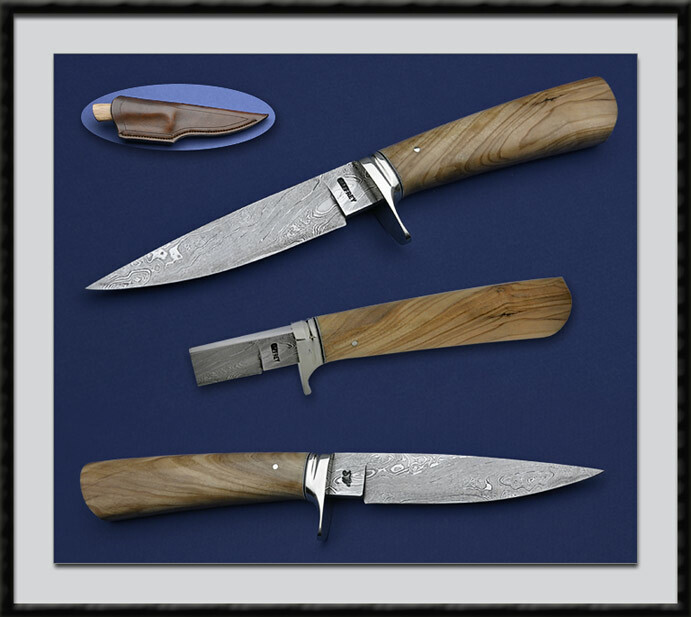 ABS Master Smith, Ed Caffrey has crafted this Olive Wood Hunter, Slow Twist Damascus Blade of 15n20 and 1080, Distal tapered with a Rounded and Mirror polished Spine, BL = 4 3/4”, OAL = 9 9/16", Nickel Silver Fittings and an Olive wood handle. Fit and Finish are that of a Master Smith. Condition is New, Direct from Ed's shop. Comes with Ed's custom 9-10oz. leather sheath pictured.